Victoria Beckham: Silk and wool-blend double-crepe dress. 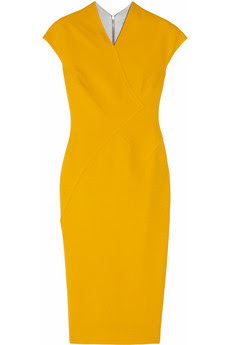 Enliven your after-dark portfolio with Victoria Beckham's bright-yellow double-crepe dress. Ter inspiration from the runway and this style, the dress designer's 100th. Mix this dress with knee boots, vinader cuff, clutch, silver jewelry. This bright yellow dress, made ​​with a mixture of silk and wool. This dress has a small V-shaped neck equipped with cap sleeves, diagonal seams, pintucks. Silver satin trim and double-ended zip Fastening through the back. 50% silk, 50% wool; trim: 100% silk. Dry clean.